Bernd Oppl is an artist born in Innsbruck, based in Vienna. Has studied fine arts (painting and graphic arts) from 1998 to 2007 under Ursula Hübner at Kunstuniversität Linz (Austria) and, since 2008, fine arts under Dorit Margreiter (video and video installation) at the Academy of Fine Arts Vienna, Austria. 2008 advancement award for contemporary art of Tyrol (Austria), 2008/2009 grant of the Kunstuniversität Linz (Austria). An empty hotel room including the interior gets wrapped by a coating of ice. The camera focuses on details before zooming back and showing the whole room. The zoom is synchronized to the freezing of the room. The empty room is the leading actor who does a choreography with the freezing water. The process of the freezing changes the readability of this room from a hotel room to an ice cave. 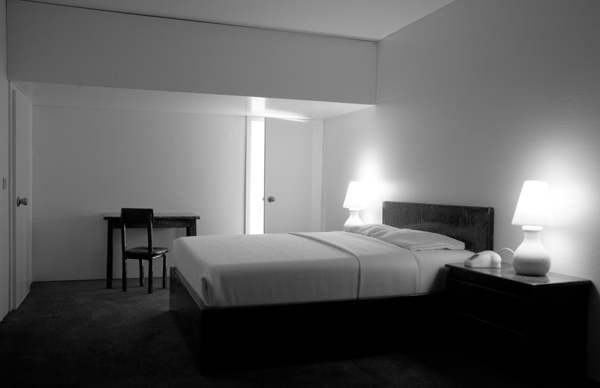 Bernd Oppl, Hotel Room, 2011.